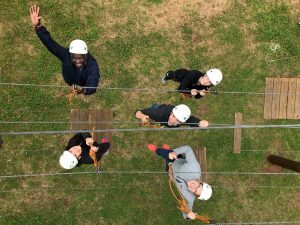 When Victoria Forbes-Roberts, the Vice President of Pricing and Revenue Management at Delta Air Lines, was asked to develop a nine-month-long leadership training program for high-performing employees in her division, she knew right away that North Carolina Outward Bound School would be involved. She had been inspired by the program at an early age when one of her high school teachers, who had been an instructor for Outward Bound, integrated the organization’s experiential learning methods into her classroom. The Outward Bound approach—placing people in challenging situations and facilitating the outcomes—had made a lasting impact on her. “A big part of leadership development is being exposed to a certain amount of vulnerability,” she says. “The Outward Bound experience always pops up on the top of the list as the most meaningful part of (our) entire program.” The one-day Outward Bound course takes place at the beginning of the Delta’s LEAD Program and includes a handful of group initiatives in the morning and a high ropes course—a series of challenges harnessed participants must navigate as a team. For some participants, the high ropes course is thrilling; for others, it’s unsettling, but it’s an experience, she believes, that demonstrates the value of building lasting and meaningful relationships. As for Delta’s bottom-line: the program has played an essential role in retaining and promoting talent within their division by helping participants cement stronger teams in the workplace. Inspiring people to push beyond their comfort zone and tap into hidden strengths has been part of the mission of North Carolina Outward Bound School (NCOBS) for five decades. And while the school is best known for delivering life-changing wilderness programs, NCOBS is also on the cutting edge of facilitating professional and corporate development programs serving a wide range of organizations, from large multinational corporations to local non-profits with just a handful of employees. Bill Murray, the Director of Outward Bound Professional (OBP), admits that taking people out of the office for more than a day or two is increasingly rare. Even so, he says that NCOBS’ corporate clients have increasingly sophisticated expectations of the Outward Bound experience. “There’s more pressure on organizations to get the most they can out of their individual employees and their teams,” he says. These expectations have compelled Bill and his staff to design and deliver programs that provide meaningful results in less time. The key is to make the lessons as tangible and transferable as possible, regardless of the course length. Working over a period of time with a single organization, such as Delta and The Lee Institute’s American Leadership Forum, has also been helpful. “We gain a much deeper understanding of the organization, their culture, and their objectives, and in turn, they understand more deeply the work we do and what they can gain from it,” says Bill. The goal of the American Leadership Forum (ALF) program is clear cut: to strengthen the leadership abilities of established civic leaders to better serve the public good. Participants are heads of business, government, education, faith, and community-based organizations. Cyndee’s ALF chapter is part of a nationwide organization that requires each regional program to incorporate an outdoor component into their trainings. Outward Bound Professional Instructor, Bob Stout, has worked for the school for nearly three decades. Before becoming an instructor, Bob worked as a human resource manager for a manufacturing firm.